BRIEF VERSION FOR FREE HERE! It helped that I was single then. I had no babies that needed diapers or a wife to romance on dates or a house mortgage to pay. So poor was okay. I didn’t need money. I was happy preaching, writing, and doing ministry work among the poor. I really thought that to love the poor, I had to become poor. I also used to think that to be close to God, I had to be poor too. I had this subconscious belief that money was evil. Today, I’m a Truly Rich missionary. I chose to become an entrepreneur. I now run businesses, invest in real estate properties, and invest in stocks and other paper assets. As of this writing, I have 16 income streams flowing to my life. Yes, I’m still a missionary. I still preach, write, and work among the poor, lifting them out of poverty. And the impact of my ministry has multiplied a hundred times more. But in case you’re asking, I don’t drive a luxury car or own a mansion. Oh yes, I can now afford to buy them. But as a personal choice, I’ve decided to remain simple in my lifestyle. Why? Not because it’s wrong to own them. I repeat: It’s a personal choice. But I believe that the ultimate purpose of wealth is to love others. And I’ve made a choice to use a lot of my wealth to make this world a better place. I’m Truly Rich because of two reasons: My passive income is much more than my monthly expenses—and so I’m able to tithe to God and give sacrificially for the ministry and the poor. And that’s what I want you to experience. Here’s what I realized: After years of helping people grow financially, I realized it’s more important to change financial mindsets than just merely increasing financial literacy. Why? Because a person can be very wise in money matters, but if he has a poverty mindset, nothing much will happen. To change your life, you need to get rid of your poverty mindset and gain a wealth mindset. That’s why I created my TrulyRichClub Gold Membership. It’s a private group of individuals that I support in their financial and support growth. It’s for people who are serious in changing their beliefs and thinking—to gain the abundance mentality they need to change their lives forever. I also provide Gold Members with the right tools, principles, and strategies to grow in their financial and spiritual life. Here’s my philosophy: I’ll serve you small bits of inspiration and instruction once a week instead of a big wallop once a month. So once a week, I’ll email you one short but very “actionable” WeathStrategy. 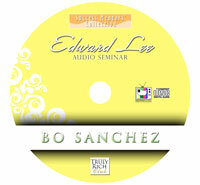 Big Blessing #5: You Receive My Powerful "How To Be Truly Rich Audio Seminar" Ready For Instant Download, My FREE Gift To You Just for Signing Up! 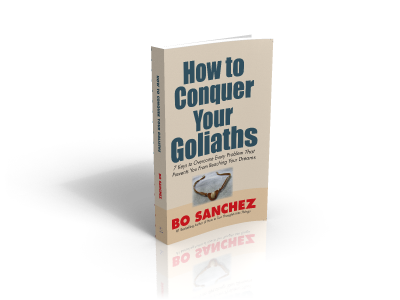 Big Blessing #6: You Receive My inspiring Ebook, "HOW TO CONQUER YOUR GOLIATH", 7 Keys To Overcome Every Problem That Prevent You From Reaching Your Dreams Absolutely FREE! Big Blessing #7: You’ll Receive My inspiring Ebook, "How To Turn Your Thoughts Into Things" Use The Law Of The Harvest To Fulfill The Desires Of Your Heart From Reaching Your Dreams Also, Absolutely FREE! What people define as luck, I define as getting ready to be blessed. My belief is simple: When the soul is ready, the blessing will appear. Right now, you’re swimming in an ocean of blessings. You don’t see this ocean, but it’s there all around you. If you lack blessings, it simply means you lack readiness to receive the blessings. There’s no shortage of blessings. There’s only a shortage of yourreadiness. I know you’ll be very inspired by this book. It’ll empower you to change your life! 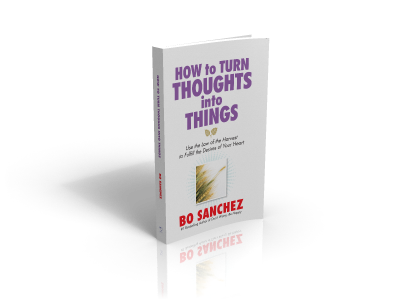 Once you subscribe to the TrulyRichClub, I’ll email to you your FREE Ebook, How To Turn Your Thoughts Into Things. Enjoy this book and be blessed! Big Blessing #8: Now, You Can Earn Passive Income Every Month “A Whooping 20% PLUS 5% Commission!” Through The "TrulyRichClub"
You never expected to earn from the Club, right? But as long as I’m here, be used to surprises! Because I’ll continue to cook up new ways to bless you. And yes, I figured a way for you to earn money! And it’s passive income: You earn while you sleep. You earn even if you’re vacationing in an island, sipping orange juice atop a hammock. That’s fine. Perhaps they want to join the GodWhispersClub. You’ll earn passive income from that too! Or perhaps they want to buy an Ebook from an Ebook Bookstore I’ll be launching very soon. You can earn 20% commissions for every sale too PLUS 5% commission for every sale referred by your first downline. The point is that you’ll be earning from all my future internet businesses. Because I was still in the process of teaching my 3 house helpers how to invest. My theory was this: If I can teach them how to invest, I can teach anyone. They don’t speak English. Honest. They speak in some strange dialect that is spoken only in the second moon of the planet Uranus. But I’ve solved that problem. If my maids can understand me, then anyone can understand me. 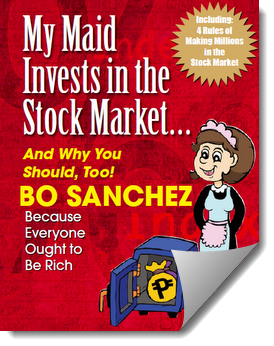 Read this Ebook and you'll also learn how to create your own personal Retirement Fund through the Stock Market. Big Blessing #11: Each, Month, You'll Receive My "Stocks Update". Also, Absolutely FREE! Here’s another thing I’ll do for you. Each month, I’ll send you a very short “Stocks Update”. I’ll tell you what companies I’m investing in and how they’re doing. Why will I give this “Stocks Update” monthly report? To give you guidance and inspiration. Especially when there’s a crisis, my “Stocks Update” will be crucial. It will prevent you from selling your Stocks because of your panic—and lose your money. And it will encourage you to do the very opposite—buy great companies when the prices are very low. I’ll remind you to invest each month. I’ll urge you, push you, beg you to be faithful to your monthly investments. I’ll tell you when its time to sell the Stocks I wrote about in my Ebook above. I’ll tell you the new undervalued Stocks that you can buy. I’ll tell you what I’m doing with my own Stocks. Let me take all the risk. 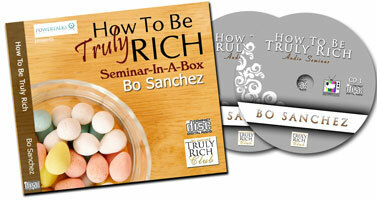 I want you to experience the blessings of an exclusive Gold Member in Bo’s TrulyRichClub. If during the first month of your membership, you didn’t find the material I sent you a powerfully inspiring Wow experience, then simply tell us—and we’ll return your money. No questions asked. And you can keep all the great stuff I sent you (worth $251.50 value) as my FREE gift to you for just trying. Do you want to receive updates on the benefits members are receiving from the Truly Rich Club? Truly Rich Club Membership – Silver, Gold and SuperGold – What’s the difference? Why Doesn’t Everyone Invest Using the TrulyRichClub Way? Thank you very much first of all for the inspiring and motivating messages that you send to my email daily thru GodWhispers. It really makes my day and I always look forward to seeing what God wants me to do for today and applying it in my daily chores, whatever I am doing. It helps me a lot in changing the way I look at life and the people around me. Thank you for all the stories/issues you tell in the TrulyRichClub. I am so motivated by them. I feel I am so much more blessed this time because I am learning the right way on how to share my blessings and I realized that it's really true that God is ready to give us abundance but it's us who limit ourselves to receive just a part of what He is preparing to give us. At the start of this month, I told myself that "Lord, I am now ready to receive my 100k income for this month." And you know what, I am having more that that as my income this month, isn't that great?! Then, last but not the least, I want to thank you for the gift you sent me, your book entitled How To Live A Life of Miracles. I want to send this message on the day I received it, that is 3 days ago but I was not able to make my letter. You know, I am not a good writer and I need time to think what to say, hehe! Anyway, now I have finished reading it and I agree with you. Our existence is a great miracle and we should use it to make this world a heaven on earth by sharing the miracles that we are to our fellowmen. I’m so much more blessed that I've come to read your books and am also a member of the TrulyRichClub. Even though I am still a neophyte member, I’m learning along the way. The few pesos that I've invested in your books and membership fees have really come back to me in thousands of pesos and I sincerely believe will be millions more. Once again, I express my thanks to you and your staff. I am very blessed by being just a member of this TrulyRichClub. I get inspired by the Godwhispers you send everyday. I also am fired up everytime I hear your talks. I listen to them in my car when I travel to Bukidnon. More power to you and I am on to great wealth so I can give more the blessings I received from our Generous God! I have never ever used my credit card online so signing up as a member of the club was the very first time. I just knew in my heart that something good will come out of it, and it did. First, receiving your packages is a breath of fresh air from the letters/bills I usually get. So I'm like a wide-eyed child in wonder whenever I get them. Second, Brother Bo is simply amusing. He delivers the message well with wit and humor. Lastly, which is the best part is that I now have ideas on how to make my daily affirmations in order to attract more wealth into my life. This e-mail is my way of saying thank you to all of you, for being there at the right time when I was searching for someone whom I can trust and relate to in my personal journey of expanding my blessings, to ultimately be a blessing myself to others. P.S. Than for the free book. I enjoyed it. In the past I would have never, ever thought that I'd be the type who would go into business. I was really a product of the poor dad philosophy. Actually I really, really excelled in school, and the only way I knew to how to be "rich" was to work for a big company. I had always thought that I was materially detached, and that it was a good thing. My interest in financial literacy started when Bo wrote about the cashflow quadrant in Kerygma magazine. The fact that it appeared in a religious publication opened up my mind to the possibility of me being a "B" or an "I." I started devouring information about it! I made teensy-weensy steps and first tried my hand at investing in a money market fund. Then I went into more aggressive UITF's, mutual funds, variable life insurance... Now I'm working hard at my business. I’m confident that I will be able to achieve financial independence within a few years, retiring at the age of 31, haha. You're part of my still ongoing metamorphosis. Thank you, Bro. Bo!!! I really love being part of the Truly Rich Club, I really want to grow, earn more to be able to help more. With the Truly Rich Club, I know God is guiding me every step of the way; I could surpass any trials because I know God is always with me. I salute you Bro. Bo, you are one of my mentors in life. You inspire me a lot. Thank you, and may God be praised all the time. 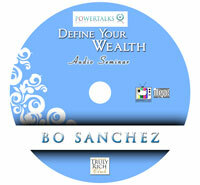 I first heard BO Sanchez give the talk "Secrets of the Truly Rich." After only 18 months from that talk, we have already earned Php 2,700,000.00 in net profits from our business. If everything goes well this season, we will make it to Php 7,800,000.00 just in our 2.5 years. How’s that for a start? Just five minutes upon entering the member’s page, I was able to listen to the Edward Lee interview on stock markets and financial intelligence. This alone was worth the membership for the entire month. It was very clear to me early on upon joining that the benefits I would be reaping would be substantial and instantaneous-- and this was just the tip of the iceberg. I haven't even received the wealth of books from the mail nor have I listened to the other recordings and read all the books. I quickly realized that Bo would be sharing his financial mentors to us first-hand and this alone was worth the price. I can say that I spend P500 every month on things that I will forget. But the same amount I'm investing in with the Truly Rich Club I obtain wisdom and knowledge that will be with me for the rest of my life. It changes the total me... my new life paradigm, the way I look on opportunities, the way I answer life’s difficulties and, especially, how Truly Rich Club has brought me closer to my family. Truly Rich Club opens my life to every wonderful challenge I am now in. Besides giving me inspiration to work until wee hours as an employee, Truly Rich Club always gives me an additional fuel to seek new opportunities. I'm not tired of pushing myself to the limit in reaching my GOALS and be of service to others. Thanks so much for the Truly Rich Club, its staff, especially to Brother Bo Sanchez. For a time, I thought my dancing skills and interest in fitness were only good for when I was in high school. I never thought I could use them for business or ministry. Because I know my passion is dancing and fitness, I can now give group and individual fitness instruction(http://www.praisemoves.com/). For a while, I had to learn how to turn my passion into profit. I had to learn to find a business angle to my passion. I had to learn that the only way for me to prosper was to stick to my core gift. These and other things, I learned from the Truly Rich Club. Being a member in this club was one of the greatest experiences that I have. As a seafarer we have the privilege to see the world, navigate around the globe and experience a most complicated and challenging life onboard. I always wondered and tried to figure out what lies beyond that beautiful horizon. But none of these wonderful experiences, the entire struggle, failure and hardship that I went through and all the privileges that we had, could answer the deep longing of my soul and could satisfy my heart’s desire. In the TrulyRichClub, I found a home. It answers all my unconscious desire. I just simply love being part of this club. I like everything here; I got a real-time conversation with God in daily basis through “God whisper.” It teaches me how to open myself to God’s blessing, healing and miracle. I learn how to lower down my defenses and allow God to use my weaknesses for His great purpose. It gives me the divine appointment to meet the God of abundance and not the God of scarcity. And of course, besides all the power talks, I’d like to earn a passive income. It made a great impact in my life; it really rocked my entire world. It revolutionized my whole being. I learned to develop a different approach in life. I became less critical and less judgmental, restoring and strengthening my relation with God, my family and myself. I’ve become a more loving person. Everything in life makes sense to me now. This club is like a pen that helps me to connect all the dots in my life and when I am able to figure it out, I see a beautiful star deep within me that’s waiting to be realized. It's like having a mentor as I am exposed to positively powerful messages I would not normally have access to on a regular day. I can "attend" the same "seminar" over and over again in my own time. It started with my mental attitude as I train myself to think abundance is everywhere and not at all scarce. Then more important is the spiritual because I strengthen my faith as I take steps to set up a second income stream. I have helped my wife start her small consulting practice with an institution. We thought and we said to ourselves that we will claim this blessing. She gave a positive presentation to the head and they are now in the process of finalizing terms of engagement. 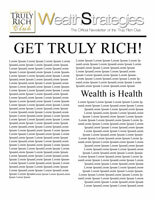 Being part of Truly Rich Club gives me more wisdom on my financial, emotional and spiritual life. It helps me to think more on my finances as an OFW and it gives me an overview of what life is all about. The effects that it has on my life are tremendous. I have learned to invest in the stock market and save for my retirement. I have also taught my kids and my relatives to invest in the stock market. Truly Rich Club is a real wealth for those who seek true prosperity. It really provides the essential factor of knowledge and understanding which gives you a powerful mind setting, motivation and guided process to achieve your purpose and dreams. Truly Rich Club gives me new hope, right knowledge, and powerful motivation to go on and achieve my dreams. It also gives me the real purpose on achieving wealth. I am currently in the process of searching myself. For the past years I've been lost, I don't really know who I am, what I like and what I want. Although I'm blessed with a loving family and a good job abroad, I still feel like unsatisfied. One Bible passage kept flashing on my mind, “What does it benefit a man if he achieves the whole world but loses his own soul?” That pulled me up and made look into my soul. I really want to achieve wealth but I don't really know what the true purpose for having it is. Through the process of searching, I found Truly Rich Club which gives me enlightenment and motivation to pursue my goals and achieve my dreams. I like Truly Rich Club because I consider it as a door to reach my DREAM. When I joined the Truly Rich Club, I came to understand the purpose of wealth, that it is not for my own alone but is to be shared with others too, especially to those who are the poorest of the poor. In this club, I slowly learned how to conquer the Goliaths in my life. I slowly came to know where to start in achieving my DREAM. The inspirational talks and messages that Bo sends me serve as tools on how I can have a better and meaningful life. They uplift my spirit and make me strive harder to be truly rich, not only financially, but spiritually. I am more mindful of spending and of saving money. I have also started giving back to the Lord as a thanksgiving for all the blessings He has poured on me. I am trying to improve my relationships with my family members. I am working hard to change and enhance my relationship with my husband. I have also changed my paradigm, from feeling unworthy of God's love and blessings to believing that I am a precious child of God and He will bless me abundantly and unceasingly. Bo has been an instrument in changing my financial mindset. I have started saving 10% of my income and have made a small investment in mutual fund. I am cleaning up all my credit cards and hoping to be debt free by the end of this year. Ever since I started giving back to the Lord, I have not been short of blessings. Somehow, they have a way of returning back to me. There is an unexplained happiness and satisfaction from knowing you have given something and someone has benefited from the gift that you shared. Best of all, my relationship with the Lord has greatly improved. I am a work in progress, a lot to be done and to change, but I know somehow that I will get there. I find the power talks very enlightening and all the e-books and the actual books that Bro. Bo has sent me. I transferred all the power talks in my cellphone and listen to them everyday. They really come alive to me because it seems like Bro. Bo is just speaking in front of me. I sometimes cry because of some touching stories that he shares. I am experiencing financial difficulties because of being jobless and being hospitalized for a month. I am still, at present, in debt, but I know by God's grace, I could overcome all these trials. Because of the inspiration that Bro. Bo is telling all of us, I know that I could reach all my dreams and aspirations. Right now, I am in the planting stage and putting value in all my "planting" and I know, the season will come for me to harvest what I have planted. Thanks a lot to Brother Bo!!! God bless us all!! The program is uplifting and refreshing. GodWhispers messages are truly powerful. Receiving the message every day affirms God's loving care and concern for my well-being—a powerful God who truly believes in me, picks me up, honors me, applauds my little triumphs, joyfully looking out for me. God restores my spirit to life. Truly Rich Club is an effective conduit of God's graces. I have learned a new mindset about acquiring wealth; its definitive purpose in my life, and more importantly, in putting values where they rightfully belong. I have started my baby steps. There is a tremendous work to be done. Sometimes, just the thought of it overwhelms me. It will surely take a while, I know. But, in faith, I have committed myself to a vision of a bountiful future for my family and for the outreach projects that I hold dear in my heart, to benefit God's poor. It is truly inspirational to be a member of the Truly Rich Club. I love all the articles as well as the bonuses that Bro. Bo sends us regularly. I am based in Canada and it is challenging to live so far away from home. Being a member of the Truly Rich Club is like being born to a family with lots of emotional support. It has been a big influence on how I manage my finances as well as a lot of help in my journey towards financial freedom. It has helped me improve in all the other areas of my life as well.